Mobile app component marketplace and former Disrupt finalist Verious has just announced a strategic partnership with mobile operator Deutsche Telekom which will expand its international footprint and reach. The mobile operator is now launching its Verious-powered Developer Garden Component Marketplace across 14 countries in Europe, where it will feature not only mobile app components for iOS, Android, Windows Phone and HTML5, but also Telekom’s own APIs. The APIs offer access to a number of Telekom’s services, like machine-to-machine (M2M) communication, cloud-based voice applications, SMS messaging, operator billing, and more. The newly added Telekom Tropo API, for example, uses tech from U.S.-based Voxeo Labs, allowing apps and websites to forward calls, talk to callers, evaluate responses, among other things. The news of the Verious launch follows the operator’s recent announcement which sees a collaboration between it and Microsoft’s MSDN network to provide developer access to APIs for use in smartphones, tablets and PCs. Through this and another partnership with Intel, the Developer Garden site now targets 17 million global developers, the company says. During the launch period for the component marketplace, some special promotions will be offered for developers looking to build with telecom APIs. Later on, Deutsche Telekom plans to allow developers to also distribute and sell their applications through its online services, too. 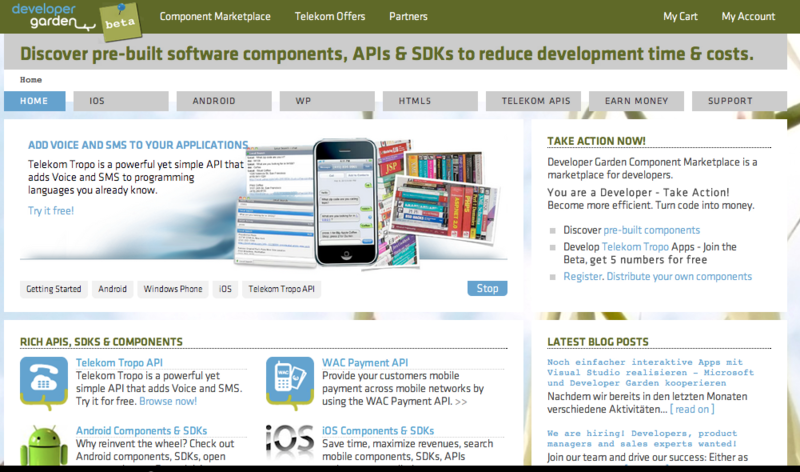 In addition to appearing on the Deutsche Telekom branded developer site, the telecom’s APIs will also appear on the main Verious.com homepage and its developer network, the latter which reaches over 1 million app developers monthly through newsletters and third-party websites. Many mobile operators make their APIs available to developers – Telekom is not the first to do so. Just recently, Chris covered some of AT&T’s moves in this area, for example. However, Telekom is the first out of the gate to offer its developer community a fully fledged mobile component marketplace where its APIs are listed alongside other components that can help speed developers’ time to market. According to Verious CEO Anil Pereira, this move shows that developers need code in addition to APIs. “Forward thinking service providers are trying to give developers as much value as possible as things move toward an ‘app world,'” he says. The sentiment was echoed by Rainer Deutschmann, Senior Vice President of the Core Telco Products business unit of Deutsche Telekom, who said the company launched the marketplace to help support developers and make their work “easier and more profitable.” The marketplace is now available here.